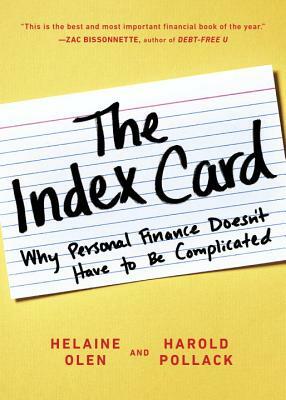 When University of Chicago professor Harold Pollack interviewed Helaine Olen, an award-winning financial journalist and the author of the bestselling Pound Foolish, he made an off­hand suggestion: everything you need to know about managing your money could fit on an index card. To prove his point, he grabbed a 4" x 6" card, scribbled down a list of rules, and posted a picture of the card online. The post went viral. HELAINE OLEN is the acclaimed author of Pound Foolish: Exposing the Dark Side of the Personal Finance Industry, which was featured on The Daily Show with Jon Stewart and PBS’ Frontline. She writes the Spread the Wealth personal finance column for Inc. Her work has appeared in numerous publications, including The New York Times, Salon, Slate, where she wrote the popular column The Bills, and the Los Angeles Times, where she wrote the popular Money Makeover column. HAROLD POLLACK is the Helen Ross Professor of Social Service Admin­istration at the Univer­sity of Chicago, where he researches health and urban policy concerns and is a nonresident fellow at the Century Foundation. He writes regu­larly for the Washington Post, Politico, Atlantic Monthly, healthinsurance.org, and other publications.